"In 397 Britain was part of a Europe-wide state, the Roman Empire, with a single currency, a centralised military and legal system, and an elite connected to a transnational culture spanning western Europe and the Mediterranean with Latin as its official language. While the Roman Empire itself was officially Christian by this date, most of the ruling elite of Britain remained Pagan, and temples rather than churches dotted the late Romano-British landscape. The population as a whole appears to have retained pre-Roman, 'British', tribal and cultural identities and to have spoken a 'Celtic', not Germanic language" [Dark, K. (2000), Britain and the End of the Roman Empire, Tempus]. "The old Ladybird Book of British History had a vivid picture of Roman Britain coming to an abrupt end in the fifth century with the legions marching off and the Roman names for places being superseded (a composite image of departing soldiers and broken signposts, as I recall it). But this is a mistaken view of what happened. By the late Empire, the Romans of Roman Britain were not immigrants from Italy but locals who had adopted the Roman lifestyle and everything that came with it. A bunch of legionaries departing the island would not bring Roman life to an end. Britain, as everywhere else between Hadrian's wall and the Euphrates was no longer Roman merely by 'occupation'. The 'winding-down' hypothesis. Formerly, the prevailing 'establishment' view that from about 360 Roman institutions and culture gradually declined and, by 450, all but the Christian church had more or less disappeared. The Romano-Britons went back to their 'Celtic Iron Age' ways in the West and North while the Anglo-Saxon invaders swept everything before them in the South and East. The 'new establishment' view. That there was a dramatic discontinuity between 'Roman Britain' and 'Anglo-Saxon England'. He terms this the 'new establishment' view since this was the interpretation of many professional archaeologists by the early 1990's. This view held that Roman Britain had functioned until around 400-430 and then dramatically collapsed. The pagan Anglo-Saxons settled in the East during the 5th century but there were fewer of them than was believed by the former establishment. The Britons and Anglo-Saxons were virtually identical in terms of economy, technology and social organisation. But, being Christian, the Britons left no grave goods and were therefore 'invisible' to the archaeologist. The country was split into small kingdoms that eventually coalesced politically and militarily. In what is now England, the Anglo-Saxons dominated and the British culture and language disappeared through inter-marriage and cultural dominance. Fashion change. 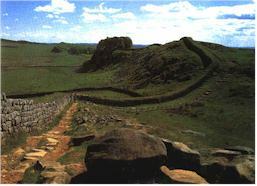 A view put forward by Richard Reece who argued that the transformation in Roman Britain took place in the third and fourth - rather than the fifth centuries. Roman towns had failed because Britons were not urban-minded. In fact, Roman culture was just a superficial facade that disappeared with the imperial administration. Instead, village settlements grew up around Roman villas and, in the east, adopted Anglo-Saxon fashions from a relatively small number of migrants. the west, with a pagan un-Romanized elite. The Romanized zone employed Anglo-Saxon mercenaries who rebelled in the fifth century and quickly took control. The west retained their independence but were under the overlordship of Anglo-Saxon kings. The Anglo-Saxon rulers retained elements of Roman administration while their western counterparts adopted Anglo-Saxon culture because of its higher status. That Kingship was the form of rule prevailing throughout the British Isles from mid-5th century onwards. That the population of Britain were all at similar social, economic and technological levels. The material culture of Roman Britain was no longer produced from the early 5th century, and was not in use by the middle of that century. Paganism dominated eastern (Anglo-Saxon) Britain in the 5th and 6th centuries even if some small Christian communities remained. Towns were not in use between mid 5th century and the seventh century. The rulers of eastern Britain all had an Anglo-Saxon culture and religion during that period. Britain was somehow different from the rest of Europe. Dark argues that Britain shared many aspects of Late Antique Romano-Christian culture with its European neighbours. In fact, he believes, Britain retained more of the Roman traditions than many other regions of Europe.